Online Submit Update TS Teachers data information Particulars @ childinfo.tg.nic.in. Telangana SSA guidelines How to Submit Online TS Teachers Particulars. Telangana Sarva Shiksha Abhiyan TSSA Instructions to District Educational Officers to issue necessary Instruction to the Mandal Educational Officers Headmasters and Teachers in the concern District to Update Teachers Information and Cadre Strength particulars Online at Child Info Website by every Indivisual teacher on or Before 10.01.2018 at Telangana State Official website www.childinfo.tg.nic.in. Online Submit Telangana Teachers data information Particulars @ childinfo.tg.nic.in. 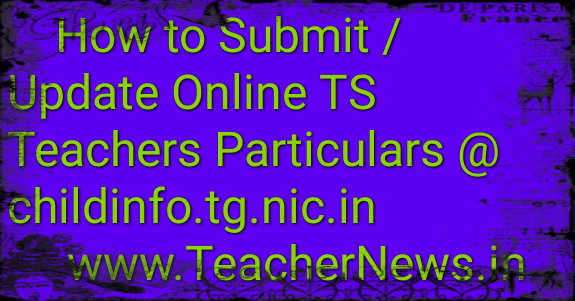 Telangana SSA guidelines How to Submit Online TS Teachers Particulars.